A tapestry depicting the musicians who formed part of the wedding ceremony based on the famous work by William Morris. It's partner work, the Bridesmaids and itself together form the complete work, The Ceremony, the original of which is by Burne-Jones. True to the aesthetics of Morris and Co, the attention of this tapestry is as always, to the rich flowing garments of the subjects, the overall composition, and the detailing in the leafy grounds and the forest beyond the river just behind this wedding ceremony. A muse as well as a lutist and two stringed instrument players form the musical gathering. Morris and Co were known for their works in the industrial age of a high degree of individuality and aesthetic beauty for the sake of beautiful decoration in itself, and even today, the particular uniqueness of Morris' works are still held in high regard in museums, homes and art galleries alike. 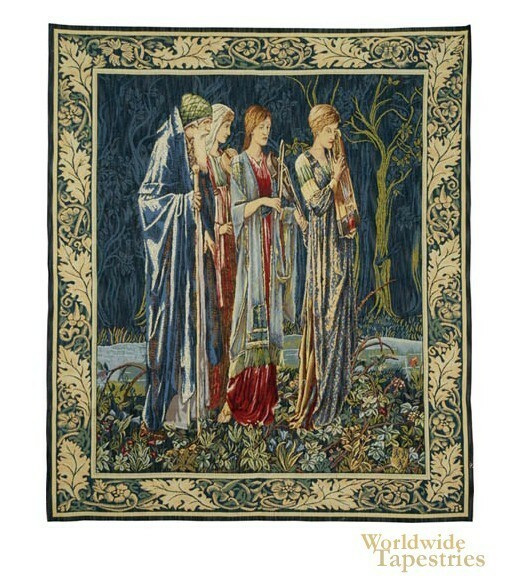 This tapestry "The Musicians" is backed with a lining and a tunnel for easy hanging. Dimensions: W 29" x H 35"